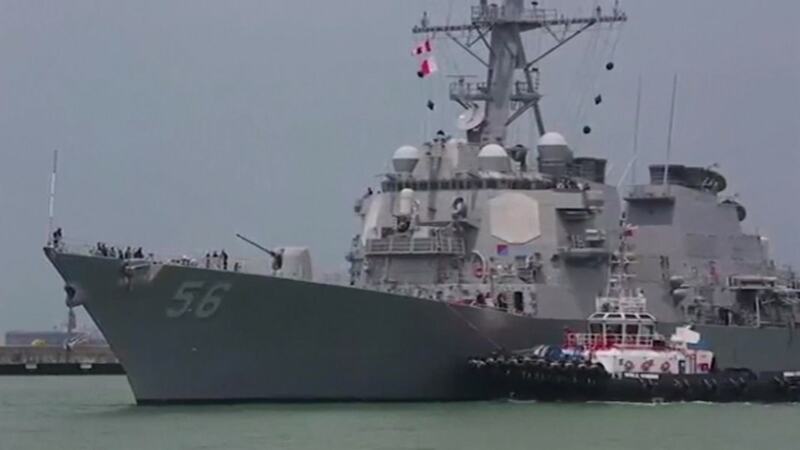 The command officers of the USS John S. McCain were relieved of duty by Navy brass on Tuesday, October 10, following the ship’s August collision near Singapore with a merchant vessel that resulted in the deaths of 10 sailors. The ship’s commanding officer, Cmdr. Alfredo J. Sanchez, and the executive officer, Cmdr. Jessie L. Sanchez, were said to have exercised poor “judgement” and “leadership,” respectively, according to a statement from the U.S. Pacific Fleet. “Both were relieved due to a loss of confidence,” it said. “While the investigation is ongoing, it is evident the collision was preventable, the commanding officer exercised poor judgement, and the executive officer exercised poor leadership of the ships training program,” the statement read. “Cmdr. A. Sanchez was reassigned to Commander, Naval Forces Japan (CNFJ) and Cmdr. J. Sanchez was reassigned to Ship Repair Facility (SRF) Yokosuka,” the Navy said. Last month, Admiral Scott Smith announced his retirement from Command of the Pacific Fleet after two separate collisions caused the deaths of 17 sailors, in total. The USS Fitzgerald slammed into a Japanese merchant ship in June resulting in seven sailors deaths, and the McCain struck a 30,000-ton tanker in August, killing 10 and injuring five.